Named for its 17th- to early 20th-century owners, the Salvin Hours is one of the largest and most richly decorated English books of hours. Its decoration, created by two artists, resembles contemporary wall paintings in the Oxford area, suggesting that it was made in a workshop there. Its original owner probably was a high-status person living in Lincoln because it also resembles 13th-century books of hours associated with that city. It lacks a calendar, which would have helped to locate its original place of use because it would have listed saints' feasts special to a particular place. The Hours of the Virgin was borrowed from the prayerbook used by monks to become the core of the Book of Hours.The devout lay person recited the prayers and hymns of prime at dawn. 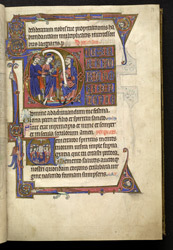 The first letter shows Christ before the high priest Caiaphas. Caricatures of Jewish 'handlers' and Caiaphas contrast with the idealised Jesus. Hideous, richly dressed Caiaphas holds a huge scroll symbolising Old Testament Law while the barefoot Jesus holds a book (the gospels?) with covered hand. Such pictures occur in 13th-century books of hours, before the expulsion of the Jews from England in 1290. In the margin a lay woman peers out from a leaf form, perhaps some reference to the user. Below in the smaller initial of the hymn 'Veni creator' ('Come creator') the dove of the Holy Spirit descends on the apostles and Virgin (Pentecost).